Food policy touches on multiple issues related to the production, distribution, and availability of the foods that we eat. This topic touches on issues from institutional food procurement practices, to reducing consumption of sugar sweetened beverages. Implementing standards for government food procurement has been recommended as a means for 1) improving the nutrition of people who consume government-sponsored foods; 2) modeling healthful nutrition to the wider public; and 3) increasing the marketplace demand for healthy foods. Proponents include the Institute of Medicine, the Centers for Disease Control and Prevention, and the White House Task Force on the Prevention of Childhood Obesity. Some New York State agencies do currently have food purchasing and nutrition standards, but New York State does not have a statewide, multi-agency policy ensuring the healthfulness of the foods it procures for food service or food sales. 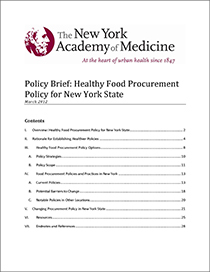 In 2012, The New York Academy of Medicine prepared a policy brief in support of a Healthy Food Procurement Policy for New York State. 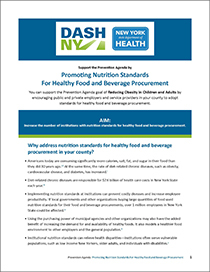 The DASH-NY Food Procurement Fact Sheet focuses on Healthy Food Procurement, one of the NYS Department of Health’s four priority strategies for preventing chronic disease. It can be used as a tool to support the development and implementation of local Community Health Improvement Plans and Community Service Plans. Consumption of Sugar Sweetened Beverages (SSBs) has been associated with increased rates of obesity, with an estimated 20% of Americans’ weight gain in the past 30 years attributed to SSB consumption. Yet, SSBs are readily available in the places where we live, work, play and learn. 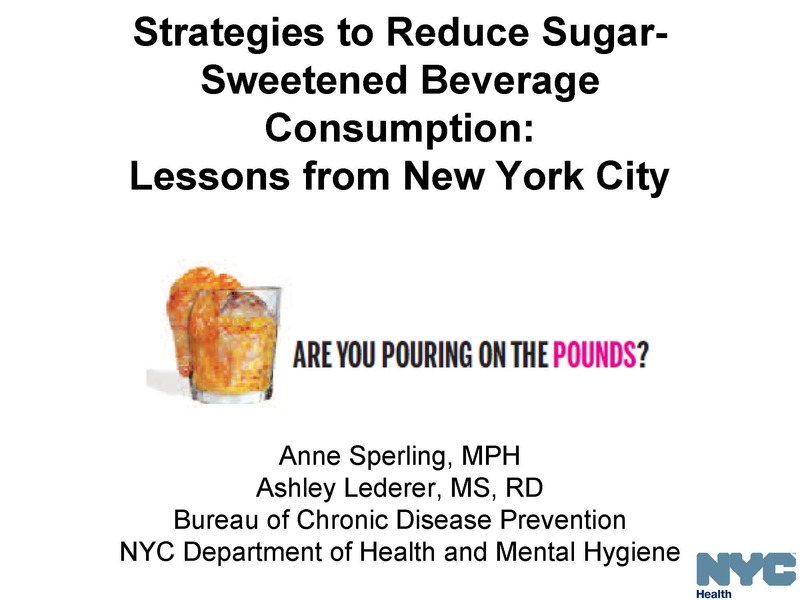 Hosted by DASH-NY, the Local Strategies to Reduce Sugar Sweetened Beverage Consumption slide presentation focused on policies and practices that can be implemented in the workplace, government buildings and other public places intended to increase consumption of water and healthier beverages, instead of SSBs. Anne Sperling, MPH and Ashley Ledrer, MS, RD of The New York Department of Health and Mental Hygiene discussed effective strategies and their work for reducing consumption of SSB’s. There is also a supplemental presentation that includes Sugar-Sweetened Beverage Consumption Data for New York State. In DASH-NY’s Leveraging Policy for Healthy Food Retail webinar, Karp Resources, a firm with over 20 years’ experience working with food and agriculture businesses and organizations, identified specific policies that can improve and increase healthy food retail, and outlined key steps in taking advantage of policy opportunities, and provided a case studies of successful implementation. Zoning is the most commonly used technique for determining how land can be used within a local geographic community. In response to the growing incidence of obesity across the United States, there have been increasing calls for using zoning to limit the presence of unhealthy food sources. 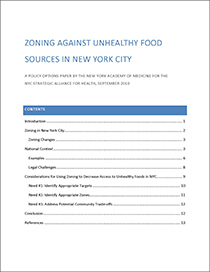 The New York Academy of Medicine prepared a policy options paper, Zoning Against Unhealthy Food Sources In New York City, for the NYC Strategic Alliance for Health in 2010. This paper focuses on the strategy of using land use zoning to limit unhealthy food sources, and more specifically on the goal of restricting fast-food retailers and/or formula restaurants (i.e., restaurants that have standardized menus, food preparation, décor, etc.). The interest in removing or limiting these types of food retailers is motivated by evidence that neighborhood characteristics affect rates of chronic disease. For example, greater density of neighborhood fast‐food outlets is associated with increased obesity. The Food Stamp Program (FSP), the nation’s largest food assistance program, is an opportunity to relieve hunger and its health effects, as well as obesity and its health effects in low-income communities. 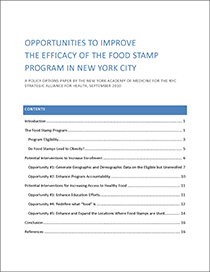 Opportunities to Improve the Efficacy of the Food Stamp Program in New York City is a policy options paper, prepared in 2010, that explains how the FSP functions in New York City and New York State, and identifies areas of opportunity for maximizing good nutrition and healthy weight for low-income New Yorkers. The first set of opportunities address factors within the program that pose barriers to maximizing enrollment among eligible individuals. The second set concern the program’s intersection with food retailers and the availability and affordability of healthy foods in low-income neighborhoods. This policy brief suggests possible approaches to these two sets of issues. This webinar from the Advancing Prevention Project on Evaluating the Food Environment discusses strategies for evaluating programs to improve the food environment in accordance with the reducing obesity in children and adults focus area of the NYS Prevention Agenda. Experts from the Harvard Prevention Research Center discuss various methods of data collection for program evaluation and practical applications.